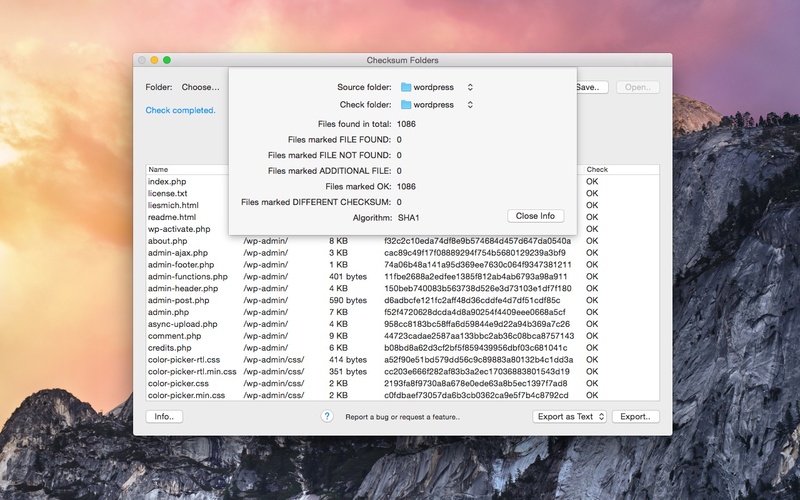 Checksum Folders for your Mac calculates and compares the checksums of all files in a folder and it’s subfolders. You can export the results as a text or CSV file. Is my backup working? Compare an important folder on your harddisk or SSD with it’s backed up version. Is my harddisk or SSD damaged? Compare a folder on your harddisk or SSD with an earlier version from a year ago. Is my RAM corrupt? Compare a larger folder with it’s duplicate. Is my folder copy forensically sound? Compare your copy with the original files and export your results. Calculates and creates a list of checksums of all files in a folder and it’s subfolders. Compares (if needed) two folders and checks if they are identical. You can interrupt your calculation or check, save your progress and continue another day. You can save your completed calculation results and check them against another (or the same) folder later. Export your results (just calculation or calculation & check) as a textfile or as a spreadsheet compatible CSV file. Supported checksum algorithms are MD5 (faster) and SHA 1 (cryptographically more robust). 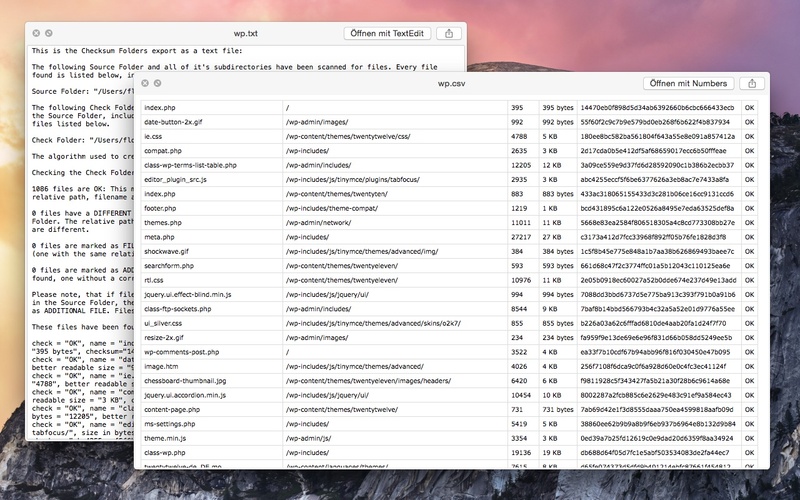 Shows the calculation progress of large files and the folder as a whole. Uses a speed and memory efficient computation and data storage model. 100% hand crafted native Mac application. 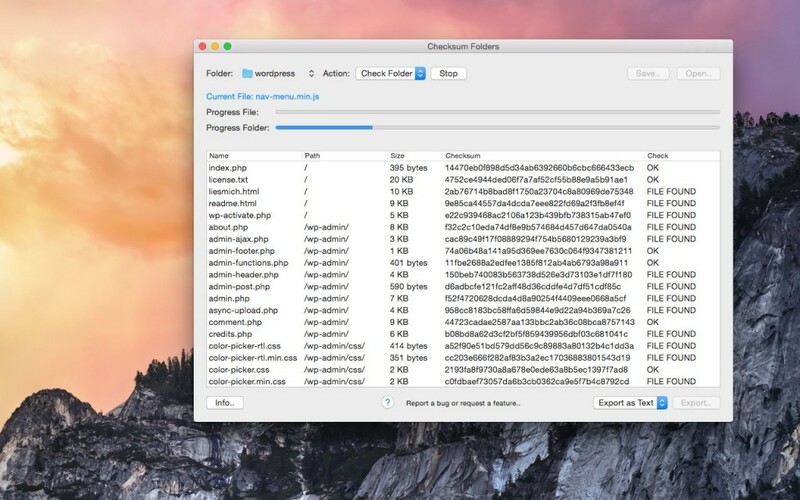 Tip 1: Store your Checksum Folders’ savefile within your backup. Now you can check the integrity of your backup whenever needed. Tip 2: If you just want to calculate single checksums or if you want to compare a file with it’s checksum on a webpage, please take a look at Checksum Utility, it is made specifically for this purpose, for single files. 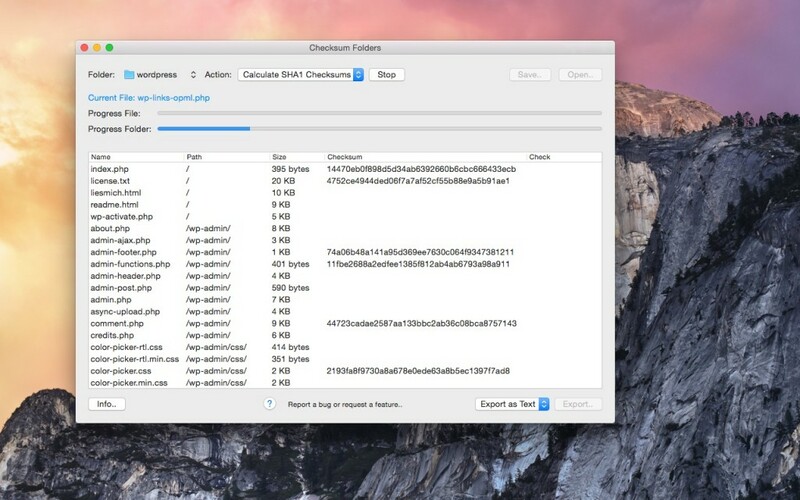 Checksum Folders is available in the Mac App Store. Calculate all checksums of a folder. Check all Checksums against a second folder. Short Info about your results. Export as text or CSV file.